School happens in many locations around our house, but this is a description of our dedicated school area. The main school area is still the same location as last year; in the room labeled "homework center" by the original builder. 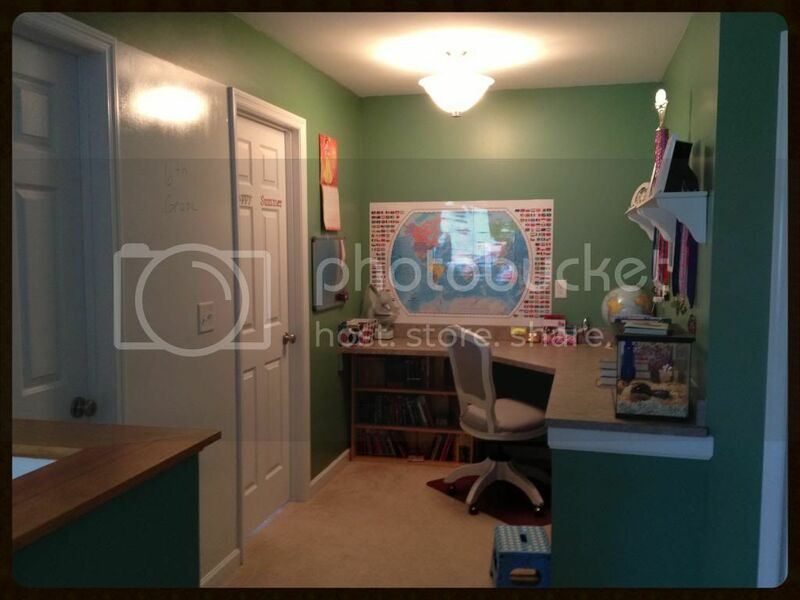 We really like how it gives Amber a space that can be completely devoted to school, yet as the short leg of an "L" shaped loft room it is open to the rest of the upstairs and receives lots of natural light from large windows in the loft. This summer we completed a few upgrades to the school room so it would fit our needs a little better. Most noticeably (view last year's pictures) are the newly painted walls. The school room walls finally match the built-in bookshelves, added last fall, along the half wall leading to Amber's area. We LOVE our bookshelves and I'm not sure how we managed all the school resources before them. We also created a dry erase wall between two doors in Amber's area. I knew we desperately needed a larger dry erase board, but I could not find a large enough one that fit the dimensions of our available space. Along came the idea for a dry erase wall and after some work (read about that here) we now have our new favorite feature. Amber also finally has her large wall map that was promised and purchased last year. Lamination never happened and so it remained in its package for the entire school year. We still have the wonderful cubes under one portion of the desk to organize all of Amber's textbooks, binders, and stacks of pencil boxes full of school supplies. I couldn't be more pleased with how those cubes worked out last year. The drawers of art supplies also stayed very well organized over the entire year. I'm sure the very specific labels on the pencil boxes, cubes, drawers, and other bins helped with the tidiness, but Amber still had to work to maintain order. Amber's custom daddy-made bookshelf remains under another portion of the desk. While some beloved books will never leave, we had a major cleanout of Amber's various bookshelves over the summer. Finally, Amber's computer still resides at her own computer desk in the main loft room. Most of the time her computer desk is stacked with things she has failed to put away (definitely not pictured), and since the computer is a laptop Amber takes it wherever her kitties are playing. (Top-L) Our built-in bookshelves around the corner from Amber's school area. LOVE these. (Top-R) Amber's cubes and art drawers. I have always loved that L shaped desk. I would love to have something like that for Keilee for her arts and crafts. Another year starting already...they go by so fast don't they? That dry erase wall ROCKS!!! So neat and tidy! Great book shelves! 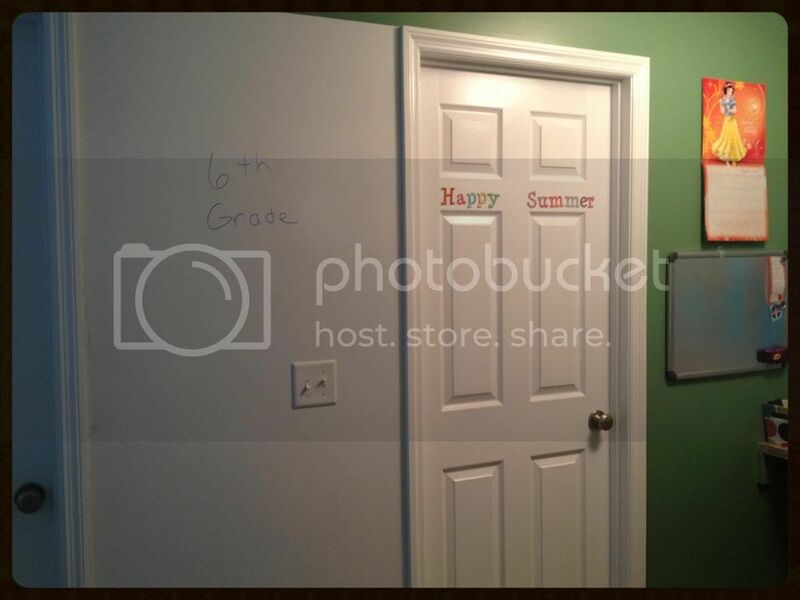 And what an awesome idea for the dry erase wall! Looks like you're off to a great organized start to another school year! We are hopefully adding a large world wall map this year. 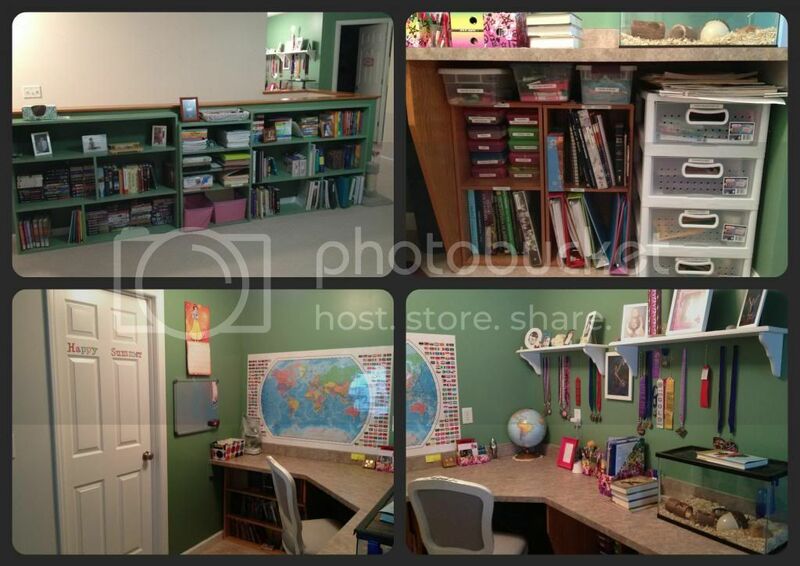 The small one just isn't cutting it anymore:) And, yes, that dry erase wall is an amazing idea! Hello Fellow OCD'er! The loft area is fabulous and the white board wall is such a fantastic idea! I also have a sad map that has been waiting to be laminated. But after finding that it was so large that laminating it would cost me more than the map (more than triple) I visited amazon for a pre-laminated one that was way cheaper :) Live and learn!